A beautiful piece of intellectual work, having both scientific and historical import. Have the curators of Oxford University’s exhibits been made aware of the significance of the fourth line of notation on the “Einstein blackboard”? I think it fair to say that what you have successfully undertaken here is an example of what Alfred North Whitehead called an “Adventure of the Mind”. 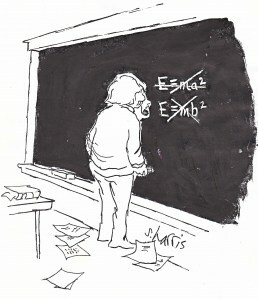 Incidentally, I have come across assertions in a few biographies of Einstein to the effect that the Permanent Faculty of The Institute for Advanced Study at Princeton saw to it that the blackboard in Einstein’s office was preserved in the state in which it was found on the day in April, 1955 when he died. I wonder whether, assuming that this story is true, a similarly informed examination of that artefact might yield some likewise interesting insight. Hey – what a great addition to a really great piece of investigation…. and a great blog post to boot. Thanks guys! I did in fact inform the Oxford museum of our finding, about two years ago now. The only action they took was to remove the existing label of the exhibit (which stated that the equations had never been published). However, last month Andrew Robinson gave a talk on Einstein’s time in Oxford during which he referred to our work; hopefully that will spur some action on the topic.